A record 1 in 20 babies was born through in vitro fertilization treatment in Japan in 2015, a recent tally showed. The upward trend in the number of IVF treatments is expected to continue as more couples are marrying later in life and increasingly turning to infertility treatment, according to experts. The survey by the Japan Society of Obstetrics and Gynecology (JSOG) found a record 424,151 in vitro fertilizations were performed in 2015, resulting in 51,001 births, also an all-time high. 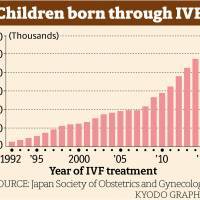 Since the first IVF birth in Japan in 1983 through to 2015, there have been a total of about 482,600 children born via the procedure in the country. Of those who underwent the treatment according to the recent tally, women aged 40 or older accounted for roughly 40 percent. The survey showed that conceiving, carrying a pregnancy to term and giving birth becomes harder with age as the percentage of women who succeeded in doing so stood at 21.5 percent at the age of 30, 18.4 percent at 35, 9.1 percent at 40 and 4.5 percent at 42. The data also found the risk of miscarriage with IVF treatments increases with age. Failed pregnancy through IVF occurred in 45.9 percent of cases at age 42 and 34.6 percent at 40, compared with 20.1 percent at 35 and 16.5 percent at 30. “There is a need to expand financial aid and support for child rearing so that women can receive infertility treatment earlier,” said Osamu Ishihara, a professor at Saitama Medical University who specializes in obstetrics and gynecology. 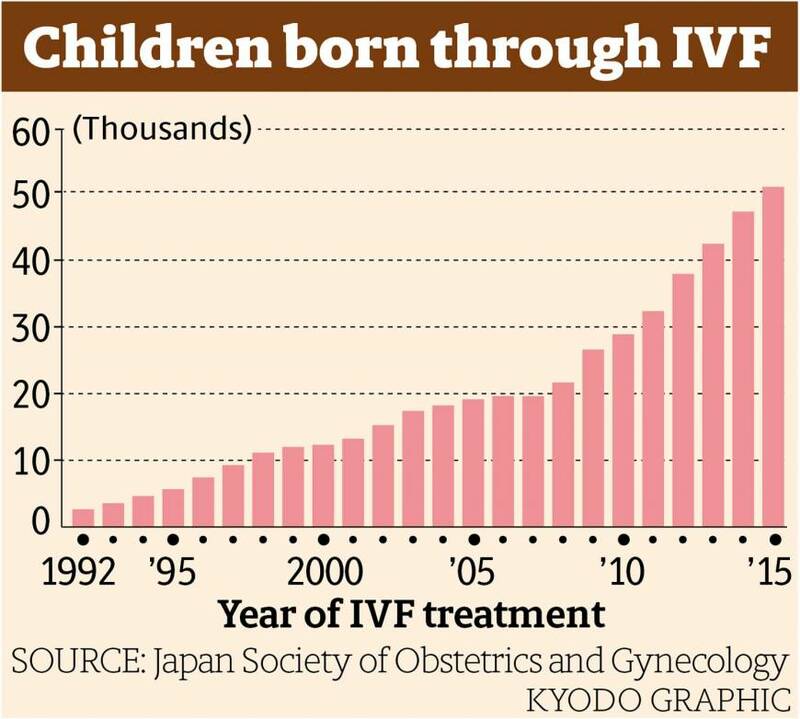 With infertility treatments considered an important factor in counteracting the falling birthrate, the government last year expanded subsidies for IVF and other forms of treatment, doubling the maximum amount to ¥300,000 ($2,760) per couple making their first attempt. The subsidies are income tested. The survey covered close to 600 JSOG member facilities nationwide. The number of babies born in the country fell below 1 million annually for the first time in 2016 when the country’s total fertility rate — the average number of children a woman will bear in her lifetime — stood at 1.44, down 0.01 point from the previous year, according to the health ministry. The figure is a far cry from the goal of 1.8 set by the government of Prime Minister Shinzo Abe to be achieved by the end of March 2026.